I’ve adjusted the Delicious recipe (from their November issue) to feed just two people, and used ready-diced chicken pieces, thereby cutting out most of the pre-amble that comes from using a whole chicken. Here’s my adjusted version. Accompany with a bottle of cider and green salad (no need for more carbs on the side). ▪ First you need to poach the chicken pieces in the cider. Put them in a large pan, pour in 250ml of the cider (save the rest for drinking) and top up with enough water to cover. Add the onion wedges, whole thyme sprigs, peppercorns and sea salt. Bring to the boil then immediately reduce the heat, put the lid on slightly askew, and simmer for up to 10 minutes until the chicken pieces are cooked through but still soft. ▪ Strain the chicken through a sieve, catching the liquid in a clean pan underneath. Put this pan of liquid back on the hob, turn the heat up high and bubble furiously for 30 minutes to reduce the cider sauce. ▪ Meanwhile, pick the onion wedges, thyme and peppercorns off the chicken in the sieve and throw them away. Give the chicken a quick rinse in the sieve, then set it aside for the moment. ▪ Heat the oil and butter in a frying pan and fry the leek and sliced onion for 10 minutes until soft and a bit brown. Season, stir in the flour and cook for a couple of minutes, then tip into a large mixing bowl and combine with the thyme leaves and lemon zest. ▪ Fry the chorizo slices in the frying pan until just starting to release oil and go crispy. Add to the bowl with the leeks. Also add the chicken, cream, tarragon and 200ml of the reduced cider sauce. Mix everything together and season with salt and black pepper. ▪ Flour a clean work surface and roll out the pastry block as thinly as you prefer (not too thin!). Sit one of your empty pie dishes on the pastry and ‘draw’ round it with a sharp knife, cutting all the way through, to make a lid. Repeat for a second lid. Then cut out some long strips about 1cm wide, enough to stretch all the way around the rim of each pie dish – it doesn’t have to be one continuous strip, you can use combine two or three shorter lengths. Also cut out some leaves or decorations for the top of the pies. There will be some leftover pastry from the block, which you can eat if you’re weird like me, or else wrap in clingfilm and put in the fridge to use in the next few days. 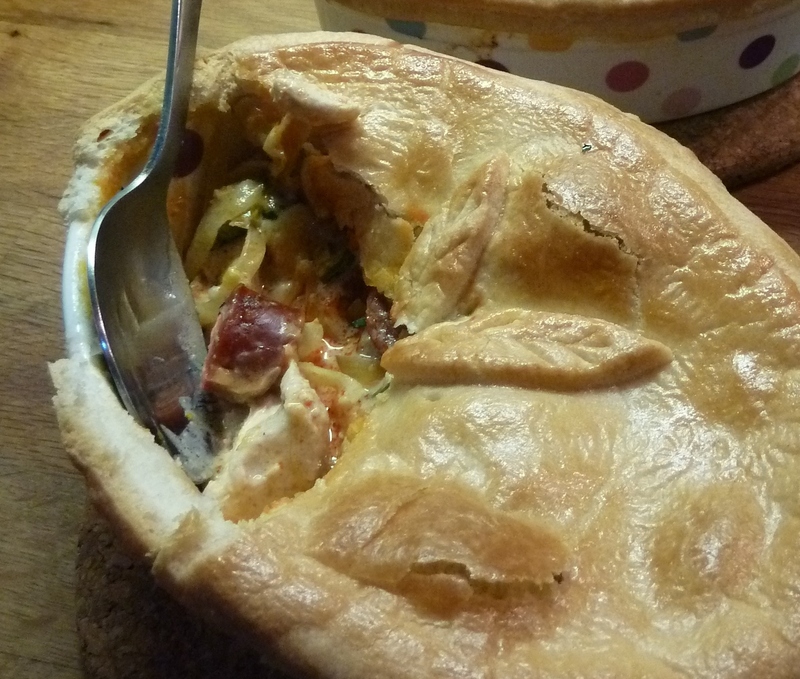 ▪ Pour the chicken, chorizo and leek mixture into the pie dishes. Brush the rims of the dishes with beaten egg and stick the thin pastry strips onto them, pinching with your finger and thumb to press the pastry securely onto the inside and outside of the edge all the way round. ▪ Brush the pastry rim strips with beaten egg and then lower the lids down onto the pie dishes. Go round the edge pressing with your finger, to crimp and stick the pastry lid to the pastry rim underneath. ▪ Brush the whole lid with beaten egg, stick on your decorations and brush them with egg too. Cut two or three slits with a sharp knife to let steam escape. ▪ Bake for 25 minutes until golden brown. Allow to cool a little before digging in. This entry was posted in Baking, Dinners, Recipes and tagged apples, autumn, cider, Delicious magazine, food & drink, pies, recipes, Spain by ionelou7. Bookmark the permalink.